The long awaited follow-up to Discostep is finally here – packed with searing electro flavors and will have you running for the dance floor. From the dirtiest moombahcore, thru to space disco. “Discostep Vol 2” offers infectious melodic content for Electro-House, French House, Dubstep and Breakbeat and many other styles. This collection fuses Disco and dubstep flavours (from french disco to contemporary moombahcore), heavy and hard hitting drums, dark and fluid talking basslines, hands-up strings and funky filters, sizzling leads and funked up synth licks providing all the components for you. If you’re looking for fine, full-fat disco flavours to inject into your productions – then your journey ends here. Checkout the demo track to hear what we are talking about. 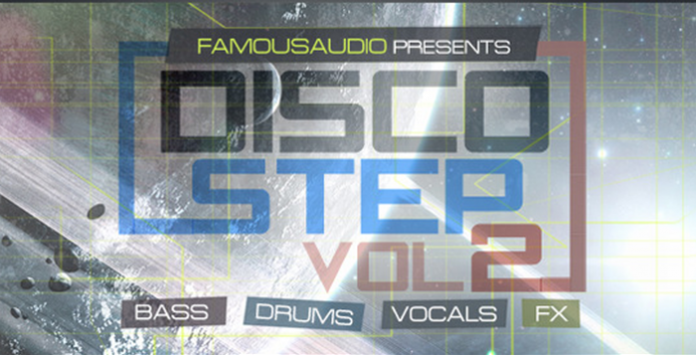 “Discostep Vol 2” features 1.17GB of raw and includes 391 loops and samples. Loops folder contains, 76 deep and dirty basslines dripping in low-end squelch, 60 floor-shaking drum loops from punchy electro stompers to dirty disco beats, 50 funked up synth loops, 25 track-starting combi loops, from creamy analogue chords to euphoric progressions to rave riffs, 24 disco loops merging the best of classic disco, driving Italo and dirty indie-dance, 19 Fx loops; the analogue spice for the disco sauce, 23 vocoder loops smattered with disco dust.. If that wasn’t already enough, we also give you 25 bass hits, 25 Fx hits, 25 synth hits, 25 vocoder hits to create your own sequenced beat. Need more inspiration? Ok then we have two inspiration kits for you -14 stems included.. All loops & samples are key and tempo-labelled for flexibility. Each loops has been rigorously produced to offer maximum dancefloor impact: from sweaty underground clubs to shimmering disco production. “Discostep Vol 2” is an authentic stash of disco melodic inspiration with loops covering everything from, retro riffs, dusty rhodes, clav runs and funky filters, sizzling leads, funked up synth licks, talkbox grooves, from deep synth basses to disco-punk basslines, slave-to-the-rave synths, floor-filling drums, sequenced grooves and arpeggios, backing pads merging the best of classic disco and soulful keys, floor-slaying FX that run the line between dubstep, electro, disco, moombahcore and rave.. If you’re after disco touch on your production, then this pack won’t fail the inspiration test!